All the attractions that the region of Las Merindades contains, make it a unique place to enjoy a weekend of active tourism of the most complete. 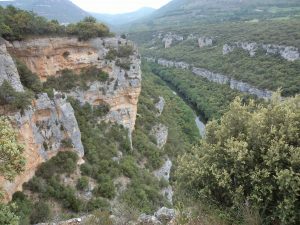 To the east of the region of Las Merindades, very close to the limits with Cantabria -province in which the protagonist of this route is born, the river Ebro. It is boxed spectacularly to outline one of the most imposing and wild sickles of all they exist in Spain. The river twists again and again, carving a deep canyon with walls as deep as lonely. Nature on all four sides is what you breathe in this place. Here begins one of the most spectacular rafting tours of all we can do in our country; spectacularness brought about not only by the colorful and fun of some of its rapids, but by the aforementioned beauty of the canyon through which the descent runs. After jumping the Quintanilla dam, where the first doses of adrenaline emerge, the most impressive is yet to come. The next kilometer offers no respite and for the most novice, all the explanations prior to the descent accumulate frantically in the mind; the weight on one side, then all the other, not stop rowing … no doubt the indications were right, and what is learned on land now reaches its correct explanation. With the expert instructions of the guide, one after another, the boat goes over the rapids, which in this section of the route reach grade IV. After this frantic and exciting stretch, the relax reaches the boat. After the most important rapids of the Ebro, the following kilometers allow a more relaxed navigation, not exempt from the draw of some fun steps that alternate with more tranquil stretches in which to enjoy all the greatness of the Ebro canyon. Among the dense vegetation of ribera, we can see the walls of the canyon, which sometimes reach a great verticality to which the oaks cling as they can. In the course of water abound the Kingfisher, the White-throated Dipper or the graceful Wagtails. Even the otter finds in this water a good place to live. Uphill, in the thicket of the mountain, the elusive roe deer and other mammals like the fox or the wild boar roam. Much higher, on the edge of the cliffs, the many griffon vultures that inhabit the canyon observe our evolution on the river from their innkeepers. Some of the most important places of the descent are the mouth of the river Rudrón and its waters as cold as crystalline that come directly from the Pozo Azul de Covanera, the hermitage of Our Lady of the Virgin of the Ebro or the hydroelectric power station of Porvenir. 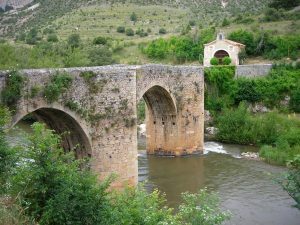 The arrival to Pesquera de Ebro, puts the end to this exciting adventure in Burgos. A place and a river to which we will surely return.